Sometimes your data isn’t a database; sometimes you need to get data from a flat file. Or maybe you need information about your users’ files. Chris Weber shows how to solve all of these problems with the FileSystemObject. Write #FileNo, "this is the old way to write output"
"using Write delimits the output for easier input"
Print #FileNo, "using Print does not"
These file I/O statements are a subset of the VBA language added solely for the purpose of external file manipulation. As disparate language statements, it’s often difficult to decide when to use Write and when to use Print. 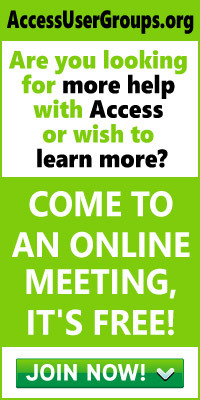 To make matters even more aggravating, in later versions of Access they’re extremely difficult to find in the Help file. If you have a copy of Access 97 installed, you can find a complete list of the statements, along with links to each, by searching Help for “Input and Output Keyword Summary.” I’ve listed them in Table 1 as a service to developers using later versions of Access. Table 1. Native VBA file I/O statements. 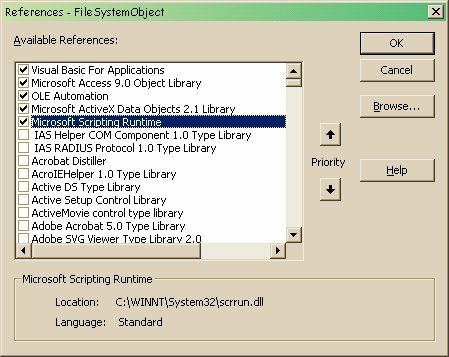 This library is not-so-commonly known as the Microsoft Scripting Runtime because its purpose was to provide a set of objects to be used by VBScript. Since many VBA developers use this library simply to get the file-related objects, it’s also commonly known as the home of the FileSystemObject. If the library has been installed, a reference to it can be found through the VBA Tools | References dialog in Access (see Figure 1). In fact, you can use this DLL directly in any application that can reference objects, such as Access, Word, and Excel, without setting a reference. This includes Access 97. If you add the reference, all of the objects within the library are exposed through the Object Browser. For example, in Figure 2 you can see all of the methods and properties of the FileSystemObject. Unfortunately, in Access 97, the Help button on the toolbar won’t work for this object (you’ll get an error message that the file BENLR98.CHM cannot be found). The button should have led you to an HTML Help file that would open in Internet Explorer, but the path to it is unknown. If you’re using Access 2000, a link in the Access/VBA Help may find the information on the FileSystemObject and all of its methods. It worked for me for a while and then it magically disappeared on me (now my Help screen opens completely blank for help for the Scripting library). Having an object library to handle file I/O is a much better implementation than the earlier VBA language statements, much the same way that the earlier Access basic macro statements were enhanced by becoming methods of the DoCmd object. For one thing, the new I/O properties and methods have more intuitive names and are better organized. And, theoretically, once a reference is made to the library, you should be able to create a variable of type FileSystemObject and have IntelliSense support you while you write code. Unfortunately, Auto List Members does not work for the members of the Scripting library. I’m going to fill the gap left by the Help system to show you how to perform the same activities you saw in my previous code. Because the referencing linkage doesn’t always work properly, you may have to use late binding on an object or variant variable to work with the FileSystemObject. Some support does exist in the editor for the FileSystemObject, though. For instance, even though I typed all of the code for TheNewWay() in lowercase, the VBA editor recognized each object and method and capitalized their names where appropriate. I find this a handy way to always verify objects, methods, and variables in my coding. f.WriteLine "this is the new way to write output"
Looking at the code, the first thing you might notice is how much more readable the new way is. One small point: You must specify True in the argument list of the FSO’s OpenTextFile method to tell the system to create the file if it doesn’t already exist. If the file doesn’t exist, and you don’t specify True, you’ll generate a runtime error. To walk you through using the FileSystemObject, I’ll use a typical programming task. Suppose I need to read in an unknown number of files on a daily basis and append the data to my tables. The data that I must read is downloaded from some application into a folder whose name indicates the date the data was downloaded. This isn’t as peculiar an application as it sounds. This scenario reflects a system that spends all day collecting customer addresses and then exports them to one or more flat files, depending on how often the system’s export routine is run. Customer addresses may be gathered multiple times in a day, and it’s possible that some customers already have their addresses in my application. For demonstration purposes, I’ve created a pair of databases for this article named FileSystemObject.mdb and FileSystemObject_be.mdb. 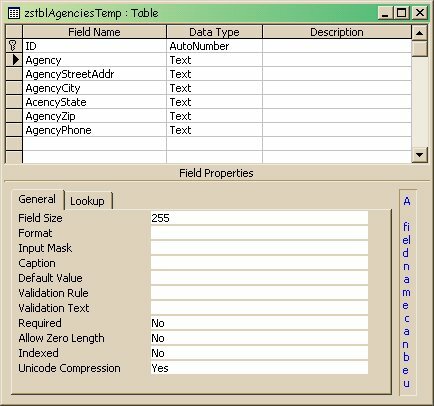 The front end has two tables, tblAgencies (linked) and zstblAgenciesTemp (local). Both have the same data structure (see Figure 3). Here, again, I’ve declared the FileSystemObject variables as generic objects for those environments where it’s not possible to declare them as their actual datatypes. The names that I’ve given them indicate their object types, so, if you can declare the objects, it should be easy to do (for example, objFile should be declared as Scripting.File). CurrentDb.Execute "DELETE * FROM zstblAgenciesTemp"
MsgBox "Today's folder not found"
It reads only ASCII data. While the FileSystemObject can create an ASCII or Unicode text file, the FileSystemObject can only read ASCII text files. It supports only forward reading, line-by-line. The FileSystemObject reads a text file in one direction: from the beginning to the end of the text file. Further, the FileSystemObject only reads line-by-line. If you need to go back to a previous line, you must return to the beginning of the file and read forward to the required line. You can’t open a file for simultaneous reading and writing. You can open a file for reading by using the ForReading IOMode parameter of the OpenTextFile method. However, if you want to modify the file, you must reopen the file for appending or writing and then open a TextStream object to make your file modifications. You can’t search for file names using wildcards. The FileSystemObject can only retrieve a specified file using the GetFile method. You can’t use wildcard characters in the filespec parameter of the GetFile method. You can’t return the file version number. While the File object in the Files collection of the FileSystemObject can return several file properties, there’s no version property. Use the GetFileVersionInfo Windows API function to get a file’s version information. You can’t sort file names from the Files collection. 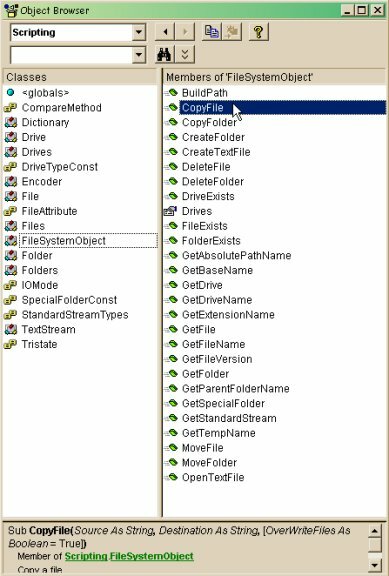 You can iterate through the File objects in the Files collection to obtain a list of the files in a folder. However, the File objects aren’t sorted. You need to use a sort routine to sort the File objects in the Files collection. So you must still use the original file I/O statements in Visual Basic for binary file access, but when was the last time you needed to do that? If you’d like to try the demo, open the sample database in the accompanying Download file and re-link tblAgencies to FileSystemObject_be.mdb. Then, put the included folder of download files “02-26-04” in the same directory as the back end. Be sure to rename the folder to today’s date in the format mm-dd-yy. Now open frmFileSystemObjectDemo and click the Download button, and you’re off and running.